The Bolshevik Revolution Took Place 100 Years Ago. What Is Its Legacy With Black People? One of the most powerful proclamations of the Bolshevik Revolution was that it would form a nation where everyone would be treated equally. The Kremlin was eager to exploit Western imperialism in Africa and the United States, where colonialism and Jim Crow were the rules of the land. The pledge was very appealing to black Americans and Africans looking for a nation where their liberty could be fully realized. This month’s centennial of the revolution, and many narratives about what the eventually founding of the USSR, in 1922, meant and what could have been will certainly follow. Its attempt to form a solidarity with black people is one of the most fascinating among them. Did the Soviets truly view black peoples as equals? It depends on whom you ask and how they reflect on the history. For me, the USSR eventually became a nation where Russians were at the top of the totem pole and other ethnic groups were ranked lower in importance. However, there was cause for optimism about the Soviet Union’s multiethnic state and internationalist message during the 1920s and early 1930s, when it was still experiencing its revolutionary fervor. When Langston Hughes traveled to the Soviet Union in the early 1930s as a member of a group of black intellectuals set to film the propaganda movie Black and White, he was pursuing a writing career in cinema that had long evaded him back in the States. The film project never got off the ground, in part because Washington, D.C., officially recognized the USSR in 1933 and Moscow agreed not to produce propaganda against the United States. Hughes wrote in his autobiography, I Wonder as I Wander, that many of the group members felt betrayed by the Soviets, that they were sold out. This did not deter all of the group members, however, since some of them stayed in the USSR to pursue artistic careers that they did not see for themselves in America. For many black people, the USSR was, indeed, a refuge from the severe racism and anti-blackness back at home. 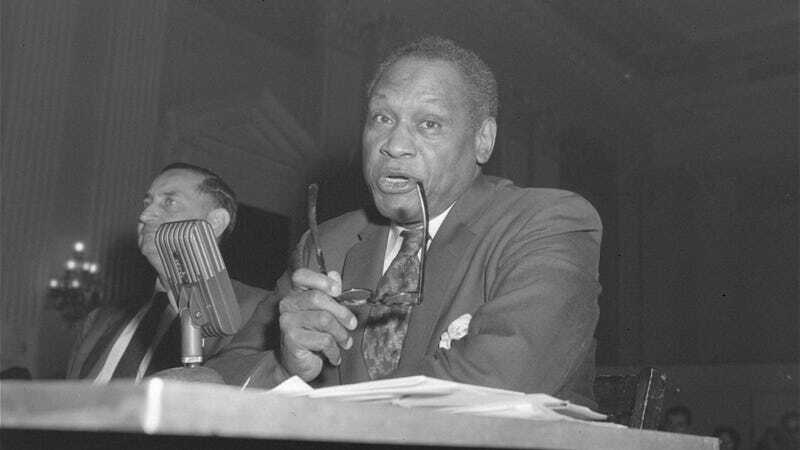 No one personified a greater appreciation for the Soviets’ treatment of black people better than Paul Robeson. When he first arrived in Moscow in 1934, he enjoyed standing-room-only crowds that would continue for years after. For all of the USSR’s messaging of black solidarity, though, it was also engaged in its own form of ethnic suppression and racial superiority that arguably mirrored those of its imperial rivals in the West. When Claude McKay was speaking at the Kremlin, the Soviets were publishing children’s books with images of black children and other ethnicities that presented them as lesser than ethnic-Russian children. When Hughes was traveling in the Soviet Union during the early 1930s, Stalin was starving millions of Ukrainians to death through collectivization. His plan was to “liquidate” the prosperous peasants (or kulaks) of Ukraine to bring agricultural production under state control. Many Ukraine specialists, like Anne Applebaum, argue that it was genocide. Maxim Matusevich, a professor of Russian history at Seton Hall University, wrote in a 2009 article that African students who arrived in Moscow by the thousands during the 1960s regularly complained about anti-blackness and racist attacks from Russian citizens who never fully accepted their presence. Some students feared for their lives to such a degree that they resorted to carrying knives. Of course, it is nearly impossible to find news reports about this from the time because Soviet authorities censored such news. But when upward of 500 African students protested on Red Square on Dec. 19, 1963, over the death of a Ghanian student, Edmund Assare-Addo, it was impossible to stop the news from reaching newspapers around the world. Students with placards that read, “Moscow—Center of Discrimination,” “Stop Killing Africans!” and “Moscow, a Second Alabama” revealed that the Soviets weren’t doing enough to stop violent animosity toward black students. Although Soviet authorities believed that Assare-Addo’s death was suspicious, it was not ruled a homicide; most of the black protesters strongly believed that his death was a hate crime. For all of the free education the USSR offered and its lack of Jim Crow-style racism, the Soviets had their own unique racial drawbacks that could be attributed to Russians’ own views of ethnic superiority, according to Kate Baldwin, a professor of American studies at Northwestern University who has written several books about the black American intellectual experience in the Soviet Union. Yet the Soviets tried, and many black people were compelled to test their sincerity. But as most black people eventually realize, there is no escape from racism. The USSR simply became one of the places where that would be the case. We were propaganda tools for the Soviets, in many respects. This didn’t negate black people’s agency to choose their own political choices. It does mean that the Soviets did not engage black Americans fleeing U.S. racism or engage Africa in the Cold War, for example, for purely selfless purposes. Soviet society revealed that it could exact violence against black people, even if it did not match that of European colonialism and American racism. But we shouldn’t be too surprised about this. Ukrainians, Crimean Tartars, Chechens and other ethnic minorities were deported and killed during the Soviet period, arguably on racial grounds. That Russians were placed above all other ethnic groups was a break from the USSR’s initial pledge of doing the complete opposite. What went wrong along the way is a very complex conversation with varying points of view. But there is no denying that, in many respects, the Soviets were caught up in some of the same racial-superiority issues for which they lamented America and Europe. The founding of the Soviet Union was one of the greatest revolutionary movements in human history. Its dissolution in 1991 was arguably one of human history’s greatest falls from global dominance. The USSR’s complicated history with race and nation reveals how difficult it is for a dominant ethnic group to overcome issues of racial superiority. A nuanced, honest review of the USSR’s history with black people and its own ethnic groups will clearly reveal that Soviet Russians were no exception.